A lot has gone down on the boardwalk in Coney Island, that’s for sure, but how about a woman painting circles with her wheelchair or a guy diving onto a slip-n-slide full of paint? This past weekend those were just two of the unique ways Brooklynites helped create ten large scale abstract paintings as part of an interactive performance art event featuring local artist Paul Campbell and his counterpart from Singapore, artist Shih Yun Yeo. Campbell, 57, and Yeo, 34, met at a conference in South Korea last October. Despite their difference in culture, language, age, gender, and experience, conversation revealed that they had similar ways of creating art. Both full-time artists combine traditional art materials with unconventional ways of mark making: Campbell uses remote control cars to create oil paintings on canvas and Yeo skates on surfaces with rollerblades covered in Chinese inks. For the event, they used water-based house paint on 7-by-7 canvases. Both artists added a little to the canvases with their methods, but mostly they left the painting to everyone else. Friends, family and random passers-by got in on the action. A bikini-clad girl dipped her long hair into a can of orange paint and swiped the makeshift paintbrush across a canvas painted sea foam green. A friend of Campbell’s son painted his hands and feet, then used a canvas as his stage for capoeira. A Russian woman in a motorized scooter let Campbell and Yeo paint her wheels white, then she drove in loops on a deep blue background. “That turned out to be one of the most beautiful paintings you’ve ever seen,” said Campbell. However, things got pretty crazy when Campbell’s sons Sam and Zac broke out the slip-n-slide. 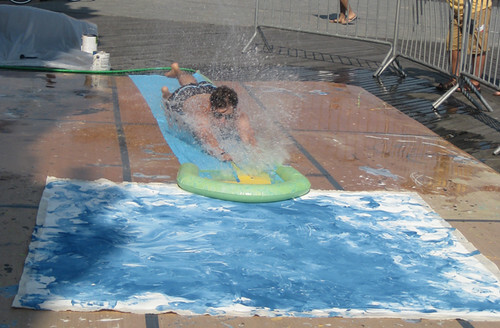 After hooking up the slide to a hose, they poured a small pool of paint at the very end, so they would hit the paint right before sliding over the canvas. Sam went first, sending yellow paint — and a lot of water — sloshing over the image, and Zac immediately followed, adding a bright crimson with his dive. The colors looked mesmerizing, swirling together, but a large puddle of water lay in the middle of the canvas. The finished paintings will be displayed from 7-10pm this Thursday July 22 at Campbell’s studio in Williamsburg at 139 North 10th Street, #3R (between Bedford and Berry). Then the canvases will travel with Yeo for an exhibition in Singapore. It gives me great pleasure to be here with you today at the opening of Coney Island Abstract: Continuity/Discontinuity – a collaborative exhibition put together by Singaporean artist – Ms Yeo Shih Yun and American artist – Mr Paul Campbell. I think we would all agree that Ms Yeo and Mr Campbell have definitely come a long way – from creating their works on the boardwalks of Coney Island to exhibiting them in a gallery in New York City and now here in Singapore. In fact, I was amazed by the fact that the seed of the collaboration was planted last October at a conference in South Korea. It is certainly serendipitous that two artists from opposite ends of the globe should find such similarities in their modes of art creation. It is indeed our privilege to be able to enjoy the beautiful fruits of their labour. As an organisation that aims to make friends for a better world, the Singapore International Foundation, or SIF, is happy to be able to contribute in a small way to this collaboration. Through our Singapore Internationale arts and culture grant scheme, we support the presentation of Singapore creative works overseas, and encourage cross-cultural partnership and friendship anchored by mutual love for the arts and creative expression. When we say a ‘better world’, we mean to build one that is ‘peaceful’, ‘inclusive’ and that ‘offers opportunities for all’. Through Singapore Internationale and many other SIF programmes that promote people-to-people exchanges, we seek to broaden perspectives and promote understanding between Singaporeans and world communities. In reality, I believe that this project had been a very enjoyable process for all – not just for the two artists, but also for the members of the public in Coney Island who got their hands dirty and played a part in helping to create these 10 paintings. I can imagine that it was probably quite a treat for the audience who witnessed this live interactive performance art event. Do ask about the one where a beach-goer “sacrificed” her hair for use as a “paintbrush”; and about two interesting pieces created by ladies on motorised wheelchairs. Today’s exhibition is essentially a cross-cultural dialogue on canvas, not only between Ms Yeo and Mr Campbell, but also between everyone who was involved in its creation. I believe it is this energetic fusion that has given these art pieces their magic. For behind every canvas is a special story – a unique mark that, each individual who participated in the artistic process has left behind. I understand that Ms Yeo and Mr Campbell are planning for future collaboration and to exhibit these art pieces to other parts of the world, and I wish them every success. It is the SIF’s hope that this collaboration will be the spark that inspires more partnerships across different cultures and result in even more exciting future projects. Thank you and I wish you all an enjoyable evening ahead!